I am always interested in how I can solve problems through change management training. Last week I took part in a fantastic presentation on drawing and cartooning to convey complex messages about culture change. The event was put on by Change Management Institute UK and hosted by Kings College London. The speaker was Virpi Oinonen who kindly shared her own work and explained how she uses her drawings for cultural change programmes. Understanding why cartoons and hand drawings can be so impactful. Virpi explained that hand-drawn implies things are in a state of flux and are still open to amendment and enhancement. Amazing visuals created with a big budget using fantastic photography and great graphics look cool but don’t represent reality. The danger with these slick visuals is that they put us into “consumer mode” which means we notice them, we might agree with the message, but at best we nod in agreement but crucially we take no action. In this case perfection kills engagement. A diagram is not a story. A diagram sets out a logical explanation of something but it can only give you facts. Without a story to explain the information people will interpret the facts using their existing belief system. There is no opportunity to shift how the information is interpreted and look at it from a different perspective. In change management we spend a lot of time creating vision statements using lots of words to describe how the future will be better. These work for people who like descriptions, but that is not everyone’s preference. These statements are often ‘enforced positivity’ which can be alienating, especially as they are often communicated too down. Also, these statements often engage people at an analytical level but they don’t create a powerful tug of emotion. It is this emotional connection that results in people sharing these visuals so that they go viral. People share them because they ‘got it’ and they want others to get it to. It is this emotional connection that makes people want to share it voluntarily. How many of us can really claim that for any vision statements we have produced, however brilliant the wordsmithing? One of my favourite parts of the evening was when we were guided by Virpi to create our own comic strip. Following her simple rules we all had a go at putting across a problem e.g. Our organisation isn’t agile or innovative enough. A comic strip is 3 boxes (think Dilbert cartoons). The first box shows the goal if you overcome your current obstacle or failing. The second box shows all of the obstacles to achieving this goal. The third box highlights the disappointments because the organisation has not achieved its goal. I am no artist, but even I managed to create a useful visual depicting greater diversity at work – proof I am no artist! I am involved in a cultural change programme to give women in a global organisation more of a voice, especially in countries where equality is not as we experience it in the West. My first box depicted a group of women and men all having their say, using speech bubbles to depict that women and men both spoke, with the speech bubbles containing equal amounts of words. In the second box I depicted groups of men talking and planning, gathered around a flipchart but with two women standing outside of the circle, with one of them trying to interrupt what the men were saying by putting their hand up. In the third box I drew the group from the first box, with only the men having speech bubbles and the women looking angry, with one shaking her head. The task of creating the comic strip did exactly what Virpi promised it would do. It got me thinking about the key messages of my change programme. 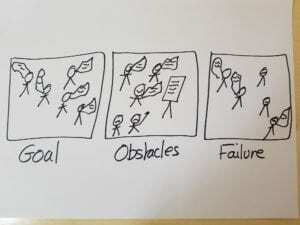 By having one simple diagram to capture to goal or the problem, it really focuses your attention to the single thing that people might notice. I was able to capture a core part of the culture change, which is that women should have equal air-time to men. I also found that by using the comic strip to showcase the problem as well as the desirable future it becomes a mechanism for displaying empathy with the iniquities of the current situation. I have used cartooning in previous Change programmes, but thanks to Virpi I feel I really understand why they work now. It has strengthened my resolve to make this a key part of my programme communication because by creating my own drawings I had a powerful experience of what my change programme means and why it is important.